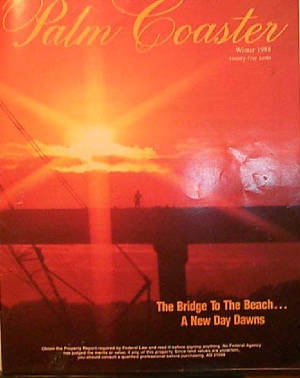 A sunrise provides a dramatic backdrop for Palm Coast's new bridge over the Intracoastal Waterway, the link to beautiful beaches Palm Coasters have been waiting for. PALM COAST< Florida This rapidly growing planned community is becoming the 'resort hometown' planners at ITT Community Development Corporation envisioned ten years ago. The "hometown' aspect of life in Palm Coast is evident everywhere. Citizens are involved with community growth; activities and challenges. Local government and ITT-CDC play stong roles in planning for and meeting those challenges successfully. 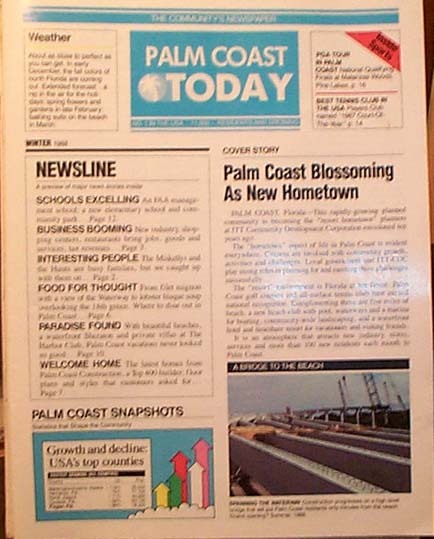 * The Palm Coaster, Winter 1988, Page 1. 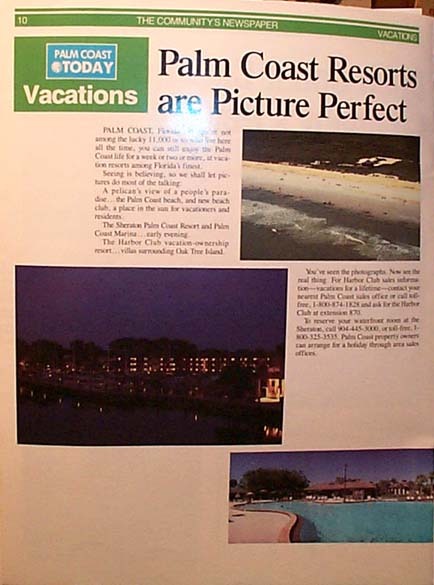 Palm Coast, Florida - If you're not among the lucky 11,000 or so who live here all the time, you can still enjoy the Palm Coast life for a week or two or more, at vacation resorts among Florida's finest. Seeing is believing, so we shall let pictures do most of the talking. A pelican's view of a people's paradise...the Palm Coast beach, and new beach club, a place in the sun for vacationers and residents. The Sheraton Palm Coast Resort and Palm Coast Marina...early evening. The Harbor Club vacation ownership resort...villas surrounding Oak Tree Island. You've seen the photographs. Now see the real thing. For Harbor Club sales information---vacations for a lifetime--contact your nearest Palm Coast sales office or call toll-free 1.900.874.1828 and ask for the Harbor Club at extension 870. To reserve your waterfront room at the Sheraton, call 904. 445.3000 and ask for the Harbor Club at extension 870. 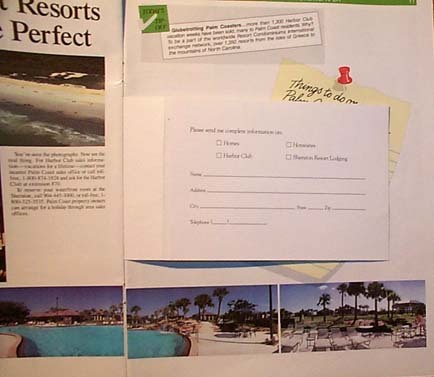 Palm Coast property owners can arrange for a holiday through area sales offices. 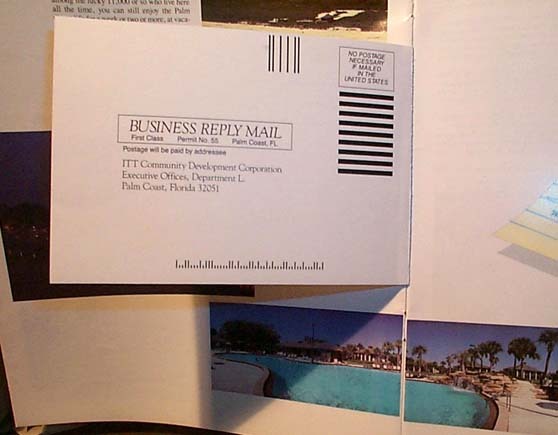 Please send me complete information on"
Globetrotting Palm Coasters...more than 1,3000 Harbor Club vacation weeks have been sold, many to Palm Coast residents. Why? To be a part of the worldwide Resort Condominiums International excnange network, Over 1,350 resorts from the isles of Greece to the mountains of North Carolina. The Band Played on The Belle Terre Middle School Marching Eagle Band's tuba player did his part at park dedication. 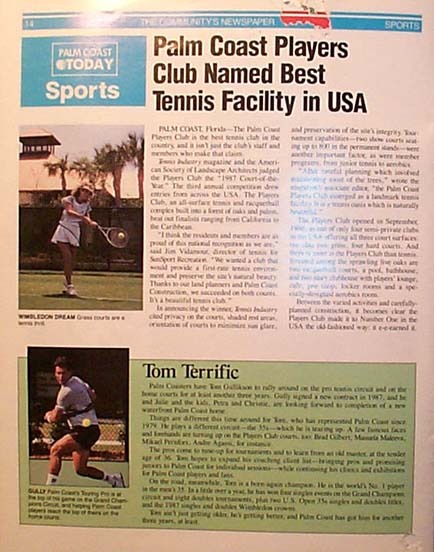 Palm Coast, Florida The Palm Coast Players Club is the best tennis club in the country, and it isn't just the club's staff and members who make that claim. Tennis Industry magazine and the American Society of Landscape Architects judged the Players Club the "1987 Court-of the Year." The third annual competition drew entries from across the USA. The Players Club, an all surface tennis and racquetball complex built into a forest of oaks and palms, beat out finalists ramging from California to the Caribbean. I think the residents and members are as proud of this national recognition as we are, said Jim Vidamour, director of tennis for SunSport Recreation. We wanted a club that would provide a first rate tennis environment and preserve the site's natural beauty. Thanks to our land planners and Palm Coast Construction, we succeeded on both counts. It's a beautiful tennis club. In announcing the winner, Tennis Industry cited privacy on the courts, shaded rest areas, orientation of courts to minimize sun glare, and preservation of the site's integrity. 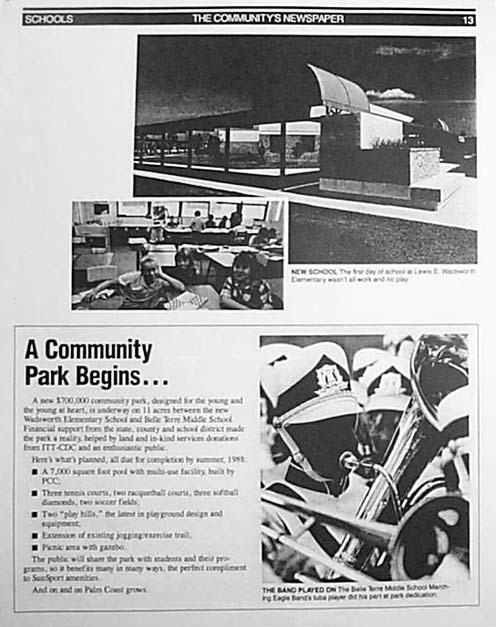 Tournament capabilities-two show courts seating up to 800 in the permanent stands-were another important factor as were member programs, from junior tennis to aerobics. 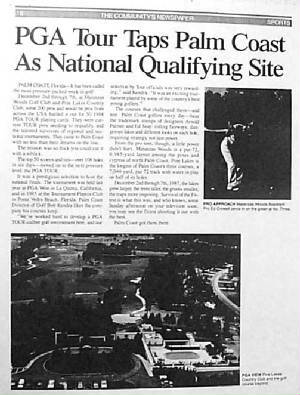 After careful palnning which involved maintaining most of the trees, wrote the magazines associate editor, 'The Palm Coast Players Club emerged as a landmark tennis facility. It is a tennis oasis which is naturally beautiful." The Players Club opened in September, 1986, as one of the only four semi-private clubs in the USA offering all three court surfaces; ten clay, two grass, four hard courts. And there is more to the Players Club than tennis. Situated among the sprawling live oaks are two racquetball courts, a pool, bathouse, and two story clubhouse with players' lounge, care, pro shop, locker rooms and a specialty designed aerobics room. Between the varied activities and carefully planned construction, it becomes clear the Players Club made it to Number One in the USA the old fashioned way, it e-e-earned it. 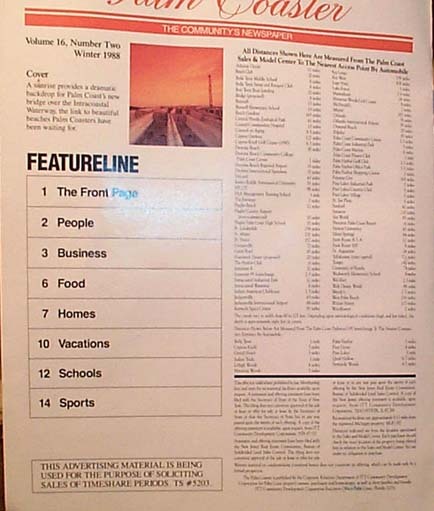 The Palm Coaster, Winter 1988, p. 14. We remain Stewards of this information; hoping for a Museum like Flagler Beach has.